San Luis Obispo police arrested a felon who allegedly fired a gun near a condominium complex last week. The man is also suspected in several recent burglaries, and officers found he had stolen goods in his possession. On Friday afternoon, a citizen reported that a shooting occurred early Thursday morning in a field south of Los Osos Valley Road near the Los Verdes condominium complex. No one suffered any injuries, according to a San Luis Obispo Police Department news release. Investigators used surveillance video to identify Matthew Spicer, 33, as the suspect in the shooting. Spicer’s vehicle was also involved, police said. Officers then searched for Spicer in areas he was known to frequent and located him around 5:15 p.m. Saturday behind the Food 4 Less on Suburban Road. Police also found the vehicle captured in the surveillance footage. The vehicle was on Suburban Road at Horizon Lane. Additionally, officers located a a motorhome Spicer uses. Investigators searched both vehicles and found several items from stolen property cases the police department has been investigating. Officers also found a handgun which they believe Spicer used in the shooting. The gun was stolen during a residential burglary in San Luis Obispo in Nov. 2015, according to police. 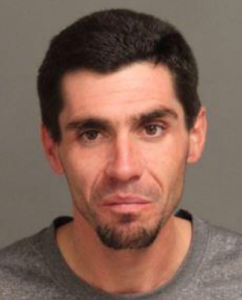 Officers booked Spicer in San Luis Obispo County Jail on charges of being a felon in possession of a firearm, possessing stolen property and being under the influence of a controlled substance. He also faces charges of assault with a firearm on a person and threatening with intent to terrorize, according to the county sheriff’s office website. Spicer remains in custody with his bail set at $70,000. An investigation into the case is ongoing. No comments on citizenship status? A convicted felon in possession of a firearm…perfect! Was he found near Spicer Hunter on Suburban Rd?